"Rapunzel, Rapunzel, let down your hair..." A daily dose of holiday windows from Paris department stores. Twinkling Northern lights, with fur and chiffon. Note the fox in the background of this wintery scene. Are you ready for a journey to the North Pole? Or perhaps you'd prefer Norway or Sweden? This mannequin with the auburn elongated braid - as featured in Monday's photo - is wearing a colourful party confection of ruffles and feathers. Fur (either real or something like it) is a recurring theme in several displays. A hooded, full-length fur to combat Artic winters. Check back every day this week for portraits of Christmas windows in Paris department stores. I braved the crowds and lots of energetic children to take more than 100 photos of these chic and imaginative holiday displays. This one featuring an endless braid is from Printemps. And if you missed my photographs of unusual hats at the Prix de l'Arc de Triomphe, check out the links at the fabulous blog carnival at HATastic. It's enough to make you rush right out and buy a hat! A grey, rainy day view upriver from the terrace of the Chateau Royal d'Amboise, Amboise, France. A bell over the castle's wide entry ramp, originally designed to accommodate horses and carriages. Amboise city rooftops as seen from the castle's walls. A broad view from the castle ramparts shows the Amboise bridge over the River Loire. The marble bust of artist and inventor Leonardo da Vinci was erected in 1869 on the spot of the 12th-century Florentine church where da Vinci was originally laid to rest. 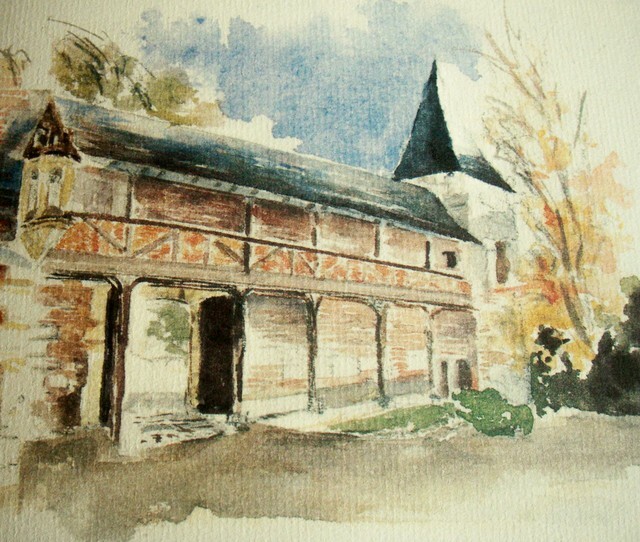 In the 19th-century, his remains were transferred to St. Hubert Chapel on the chateau grounds. This manicured Oriental garden lines the medieval southeast rampart. It is a tribute to the Emir of Algeria, Abd el-Khader, who surrendered during France's colonisation of Algeria. From 1848 until 1852 - when he was liberated by Napoleon Bonaparte - the emir, along with about 80 family members and attendants was under house arrest at the Chateau d'Amboise. He died in 1883 in Damascus. Details of brickwork from the Sentries' Walk, from whence guards could survey the Loire. The architectural variations show the transition from the French late-Gothic style of Charles VIII to the Italianate Renaissance style preferred by Louis XII-Francois I. A decorative chest in the castle's entryway. My husband said signs were posted forbidding photos, but I didn't see them! A Renaissance table and hand-carved throne. The St. Hubert Chapel was built in Gothic style by Charles VIII, on foundations of an oratory built by Louis XI. Initially reserved for the royal family's use, the chapel contains a crypt for the body of Leonardo da Vinci, Francois I's good friend. It is believed that da Vinci's remains were removed from the crypt and returned to his native Italy. The chapel has its doors flung open for visitors. The ornate facade of St. Hubert's Chapel. A close-up look at the carved scene over the chapel entrance. Details of the chapel's heavy wooden Gothic doors. The stained glass windows were produced by Max Ingrand in 1952. They illustrate the life of the 13th-century crusader and king Louis XI. The altar in St. Hubert Chapel. The town of Amboise, as viewed from the walkway next to the chapel. A photo of Clos Luce in Amboise, France, artist and inventor Leonardo da Vinci's home during the last three years of his life. The chateau is now a UNESCO World Heritage Site and open to the public 365 days a year. Charles VIII purchased Clos Luce in 1490. 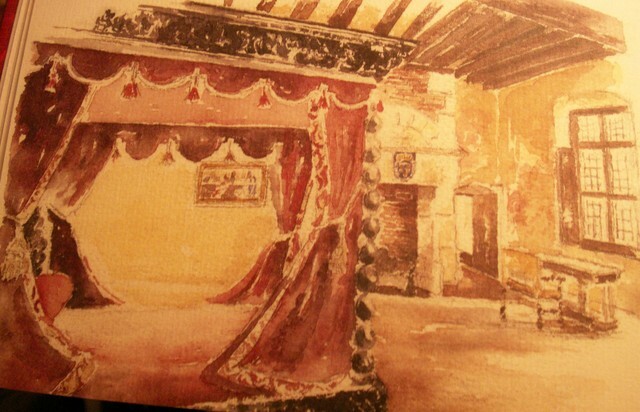 Etienne le Loup, major-domo to King Louis XI, built the house in 1471 on 12th-century foundations. 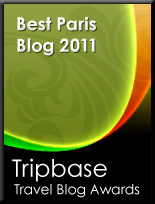 It remained a royal domain until the French Revolution. 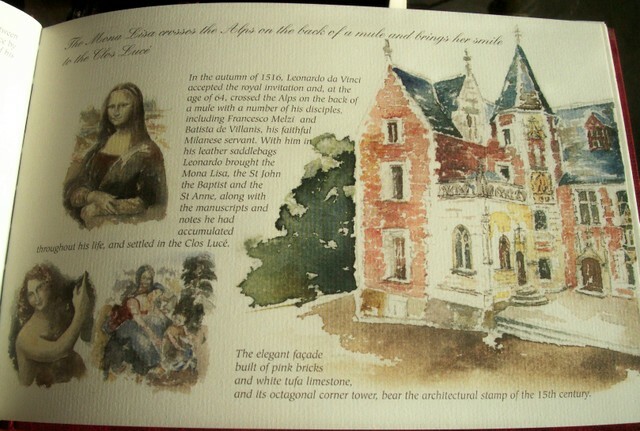 Charles VIII transformed the manor house into a summer residence of sorts for his bride, Anne of Brittany. 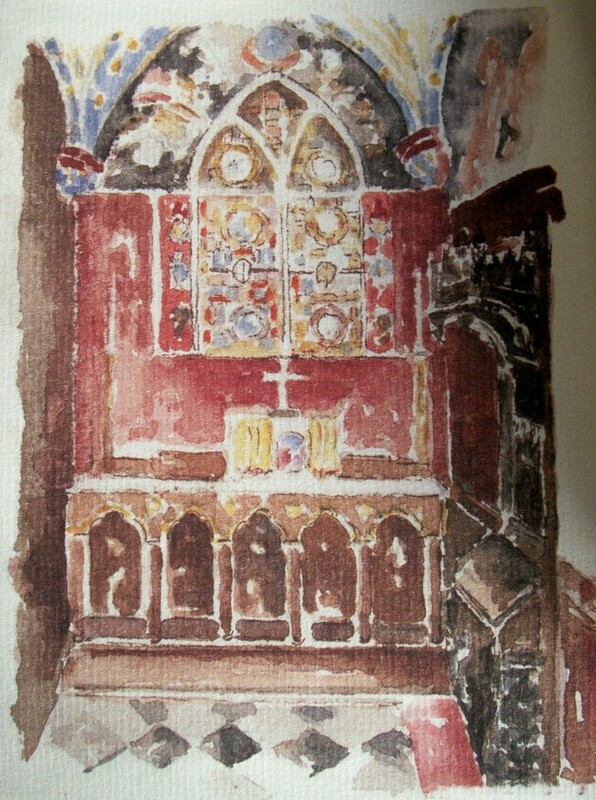 As no interior photographs are allowed, I bought the book Chateau du Clos Luce Watercolours by Beatrice Saint Bris. Da Vinci arrived in Amboise in 1516, having crossed the Alps riding a mule. He was accompanied by his disciples Francesco Melzi and Batista de Villanis and his servant. In his saddlebags, the 64-year-old Leonardo carried three major paintings, as well as his notes and manuscripts. Two of those paintings, the Mona Lisa and St. John the Baptist - the latter completed at Clos Luce - are part of the permanent collection in the Louvre, Paris. The main entrance of the 15th-century manor house, which was built of pink bricks and white limestone. An underground tunnel linked the house to the castle, 400 metres away. The doorway to the oratory, or chapel, built for Anne of Brittany. Holding her Book of Hours, the queen often prayed here for her children, who died young. Her Book of Hours was commissioned from Jean Bourdichon, an illuminator from Tours. 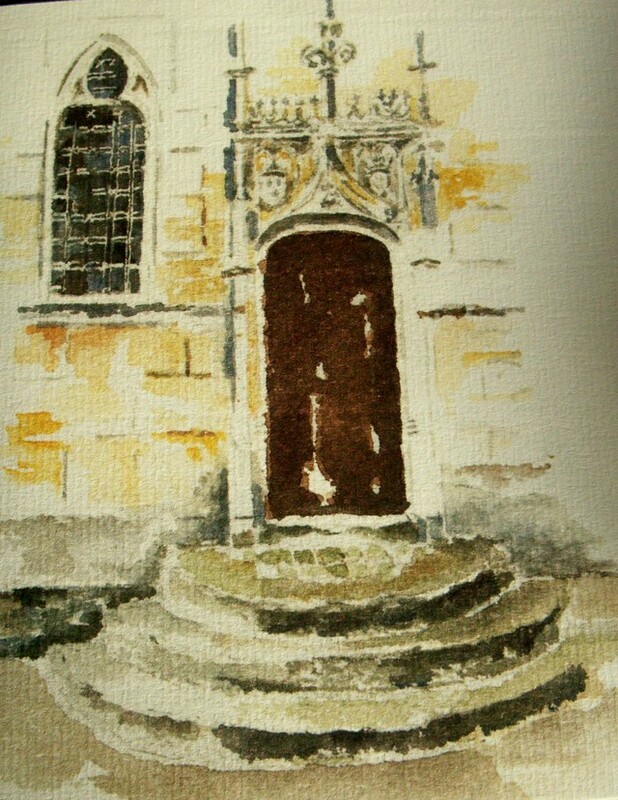 Beatrice Saint Bris's watercolour depiction of the chapel's exterior doorway. A doorway in the parapet walk and watchtower, built under Louis XI. It is the last surviving piece of medieval architecture, when Clos Luce was a fortified residence. During the Renaissance, the parapet walk was converted into a gallery, similar to an Italian loggia. The court and its ladies would sit here to watch tournaments and festivities that Leonardo da Vinci organised for his friend, Francois I. A watercolour of the parapet walk. It is now the main entrance for visitors to Clos Luce. Leonardo's bed chamber and the window from which he viewed his Renaissance garden, as well as the castle of Francois I. Leonardo's drawing of this view is part of the Windsor collection, owned by the British royal family. The Renaissance canopied-bed is sculpted with chimera, cherubs and sea creatures. Leonardo wrote his will in this room, leaving his manuscripts, and notebooks of drawings and sketches to Francesco Melzi, his disciple. 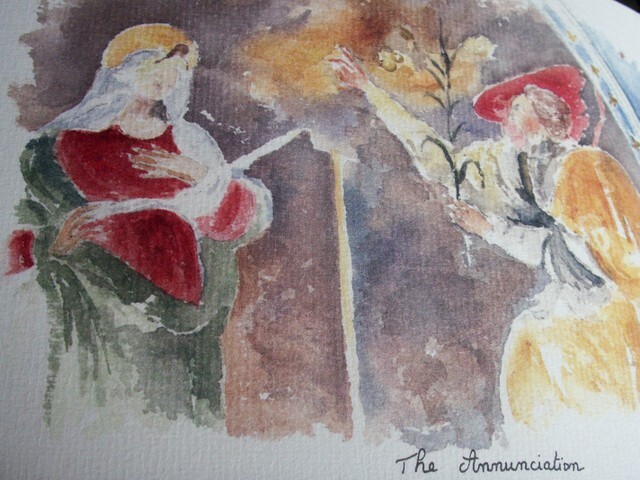 He died on May 2, 1519, after receiving the holy sacraments. Tradition has it that Francois I was with Leonardo at the moment of his death. The chapel where Anne of Brittany spent so many hours. A framed quotation from Leonardo hangs near the gothic doorway: "L'amour triomphe de tout," or "love triumphs over everything." I spent several minutes absorbed by the peaceful atmosphere in this beautiful oratory. The Chapel bears the three fleurs-de-lis of the French coat of arms, surrounded by the Collar of the Order of St. Michael, founded by Louis XI. The chapel also features a Romanesque ribbed and vaulted ceiling, painted deep blue and punctuated with gold stars. Three restored wall frescoes are attributed to Leonardo's disciples, including A Madonna of Light, an Annunciation and an Assumption. 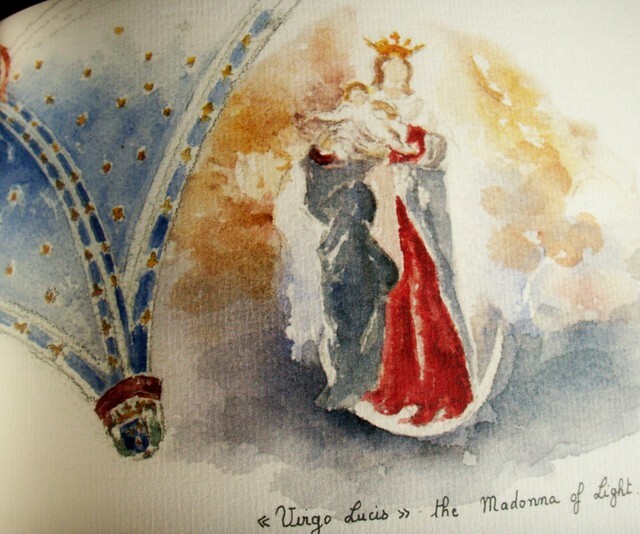 The Virgo Lucis, or Madonna of Light, is carrying the Infant Jesus, her feet resting on a crescent moon. Watercolours by Beatrice Saint Bris; photographs by Tara Bradford. A stone statue commands center stage in a display at Sophie Pretelat's Anges et Demons stand at the Antiquites Brocante currently underway at Place de la Bastille, Paris. Pillars, books and a bust at Anges et Demons. You can see more examples of Sophie Pretelat's styling skills in Michele Lalande's book Secrets d'interieurs in France or The New French Decor out December 1 in the UK, US and Canada. Mercury-glass candlesticks and vases are best sellers at Paris brocantes. A closer look at two rare mercury-glass serving platters.